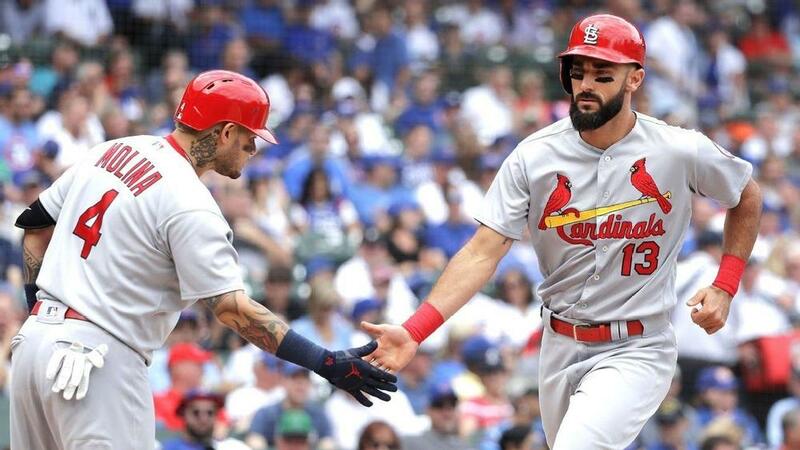 Matt Carpenter (1B/2B/3B - STL) Carpenter had a historic day Friday going 5-5 for 2 2B, 3 HR, 4 runs scored and 7 RBI. The monster performance follows him blasting a home run in Thursdays game and overall gives him 6 home runs in the past 4 games. Many discounted Carpenter following a disastrous April where he hit .155, but he has hit .289 or higher in each month since and still sports a ridiculous .958 OPS despite the awful start. That number is aided by several factors including a .381 OBP via 56 walks (7th in the NL), 30 doubles (1st in NL) and 23 home runs (2nd in the NL). Carpenter has been hitting the ball extremely hard as well as he is one of 2 NL players with 0 infield pop ups this season and among qualified hitters is second in the NL with a 51.3% hard contact rate. With the way he has been hitting he is a must start in fantasy, and with eligibility at 1B, 2B and 3B in most formats, owners should have no trouble plugging him into their lineups of a daily basis. Clayton Richard (SP-SD) Richard got roughed up by the Phillies Friday night, allowing 7 runs on 4 hits over 3 innings, walking 4 and striking out 3. Richard simply did not have it Friday, as he was tagged for 6 runs in the second inning alone and walked 3 batters, including 1 with the bases loaded. Richard thus far has compiled his usual unspectacular but passable surface numbers in the first half posting a 7-8 record with a 4.43 ERA and 1.31 WHIP to go along with a 6.68 K/9 and 3.41 BB/9. None of these numbers will jump out or lead the league but Richard has been an innings eater for the Padres ranking 3rd in the NL in innings pitched (124) putting him at an average of 6 and 2/3 innings pitched per start. Richards has been able to stay out trouble and rack up the innings by leading the NL with a 57.9% ground ball rate and inducing a league high 19 double plays. Provided he does not get dealt at the deadline, Richard should continue to provide similar value in a pitcher-friendly ballpark the rest of the way, provided he avoids walking batters - he threw just 33 of his 60 total pitches for strikes Friday. Jeff McNeil (IF-AAA/NYM) McNeil was not in the starting lineup for AAA Las Vegas Friday night. McNeil hasn't missed a beat in the past month since his promotion to the Mets AAA affiliate holding a .385/.434/.642 slash line with 5 home runs and 26 RBIs. Overall, he has slugged 19 home runs across both AA and AAA this year which is eye-popping considering in 320 games in 5 minor league seasons prior to 2018 he hit a grand total of 9. His .420 BABIP and .257 ISO in AAA have helped that number. Assuming he continues to hit, the 26-year-old will mostly most likely get a chance at some point this season, as reports have come out saying the Mets are looking to use him across the diamond in a utility type role. Bryce Harper (OF-WSH) Harper went 1 for 4 with 2 strikeouts Friday night. Harper sat out the Nationals last game prior to the break Sunday and followed up his thrilling home run derby victory with an 0-2 2-strikeout performance in the All-Star game Tuesday night. A K% that's up over 4% from last season (24.6%) and the fact that his pull rate is up almost 10% to 44.6% can explain partially why his .214/.365/.468 is lagging so far behind last years, but he may also be having some bad luck. His Hard Contact % is up from 34.3% last to year to a solid 41.1% this year but his .226 BABIP is second lowest in the NL among qualified hitters (a number that could also be explained by the higher pull rate). It is still hard to sit Harper from a fantasy perspective at this point, especially with an .833 OPS that is still strong but owners will want to monitor how he performs the first few weeks out of the gate. Manny Machado (SS-LAD) Machado went 2 for 3 with 2 walks in his Dodgers debut Friday night. Machado got off to a great start with is new club and looked right at home in Dodger Blue, reaching base 4 times. Machado comes to the NL having one of his strongest seasons to date slashing .315/.387/.575 - all numbers that would represent career highs if the season ended today. Machado seems to have a new-found plate discipline with 45 BB vs 51 Ks, a ratio that has never been that close in his career. That being said he did draw 12 IBB, due to a porous Orioles lineup around him but overall seems to have slightly dropped his O-Swing rate (32.7% to 30.3%) while also upping his contact rate (79.6% to 82%). If he can keep up a similar pattern with the Dodgers he may be in line to top the career high .876 OPS season he posted in 2016.